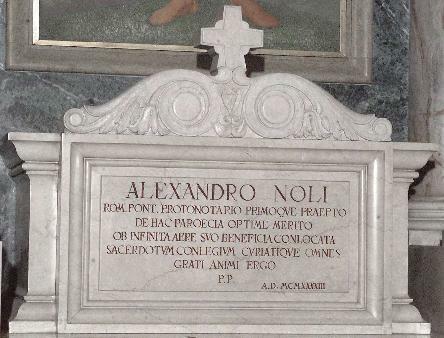 Mons Alessandro Noli was the first provost of the church. He was the pastor there for more than 50 years. 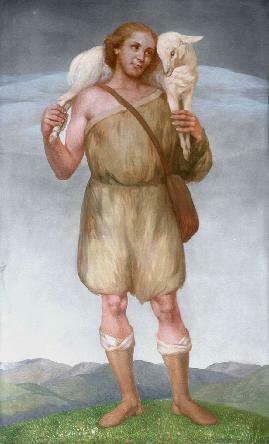 It had been thought that to commemorate Mons Noli, a priest of dedication and sanctity, that there should be a Pietà but the then Bishop of Bergamo, decided on the Parable of the Good Shepherd. Sheep is his business and his life. If you ever have met real shepherds, you know what I mean. However the sheep are stupid and rather helpless. Just like sheep. They need constant attention and vigilance. A solitary sheep can not survive for long. The theme of the painting is based on John 10, 1 - 21. We are more used to shortened versions at Mass. The full version of Christ`s words are perhaps not so well known. 1 “Amen, amen, I say to you, whoever does not enter a sheepfold through the gate but climbs over elsewhere is a thief and a robber. 2 But whoever enters through the gate is the shepherd of the sheep. 3 The gatekeeper opens it for him, and the sheep hear his voice, as he calls his own sheep by name and leads them out. 4 When he has driven out all his own, he walks ahead of them, and the sheep follow him,because they recognize his voice. 6 Although Jesus used this figure of speech, they did not realize what he was trying to tell them. 8 All who came [before me] are thieves and robbers, but the sheep did not listen to them. 19 Again there was a division among the Jews because of these words. 22 The feast of the Dedication was then taking place in Jerusalem. It was winter. 23 And Jesus walked about in the temple area on the Portico of Solomon. 25 Jesus answered them, “I told you and you do not believe. The works I do in my Father’s name testify to me. 31 The Jews again picked up rocks to stone him. "Fourth Sunday of Easter is characterized by the Gospel of the Good Shepherd - in the tenth chapter of St. John – which we read every year.
" My sheep hear my voice; I know them, and they follow me. I give them eternal life, and they shall never perish. No one can take them out of my hand. My Father, who has given them to me, is greater than all, and no one can take them out of the Father’s hand. The Father and I are one"(10.27 to 30). These four verses contain Jesus’ entire message, the core of His Gospel: He calls us to participate in His relationship with the Father, and this is eternal life. Jesus wants to establish a relationship with his friends that is a reflection of His relationship with the Father, a relationship of mutual belonging in full trust, in intimate communion. To express this deep understanding, this relationship of friendship Jesus uses the image of the shepherd with his sheep: he calls them, and they know his voice, they respond to his call and follow him. How beautiful this parable is! The mystery of the voice is suggestive: from our mother's womb we learn to recognize her voice and that of our father, from the tone of a voice we perceive love or disdain, affection or coldness. The voice of Jesus is unique! If we learn to distinguish it, He guides us on the path of life, a path that goes beyond the abyss of death. If I feel attracted to Jesus, if his voice warms my heart, it is thanks to God the Father, who has put in me the desire of love, of truth, life, beauty ... and Jesus is all this to the full! This helps us to understand the mystery of vocation, particularly the call to a special consecration." Here is the report from Vatican Radio. He did not mince his words even at the risk of being called "a fundamentalist"
He spoke against the thieves and robbers who try to enter the sheep fold. The message is simple not complex, perhaps deceptively simple and easy to not totally comprehend or to become distracted by other things. Christianity is not an intellectual sport or discipline. Any perceived complexity derives from self-delusion or self aggrandisement, the exaltation of the Self over God. Pride. The archetypal wolf in sheep`s clothing. Easy to spot in others but less in ourselves. "In Monday’s Gospel, Jesus tells his disciples that whoever does not enter the sheepfold through the gate, is not a shepherd, but a thief and a robber. "These social climbers exist even in the Christian communities, no? those people who are looking for their own... and consciously or unconsciously pretend to enter but are thieves and robbers. Why? Why steal the glory from Jesus? They want glory for themselves and this is what [Jesus] said to the Pharisees: You seek for each other's approval...'. That’s something of a ‘commercial’ religion, don’t you think? I give glory to you and you give glory to me. But these people did not enter through the true gate. The [true] gate is Jesus and those who do not enter by this gate are mistaken. How do I know that Jesus is the true gate? How do I know that this gate is Jesus’s gate? It’s enough to take the Beatitudes and do what the Beatitudes say. Be humble, poor, gentle, just ... ". "Some of you may say: 'Father, you're a fundamentalist!'. No, simply put, this is what Jesus said : 'I am the gate', 'I am the path’ [He] gives life to us. Simple. It is a beautiful gate, a gate of love, it is a gate that does not deceive, it is not false. It always tells the truth. But with tenderness and love. However, we still have […] the source of original sin within us, is not it so? We still desire to possess the key to interpreting everything, the key and the power to find our own path, whatever it is, to find our own gate, whatever it is. " "And this is the temptation to look for other gates or other windows to enter the Kingdom of God. We can only enter by the gate whose name is Jesus. We can only enter by that gate which leads to a path and that path is called Jesus and brings to a life whose name is Jesus. All those who do something else - says the Lord – who try to enter through the window, are 'thieves and robbers'. He is simple, the Lord. His words are not complex: He is simple”. "Sometimes it's closed: we are sad, we feel desolation, we have problems with knocking, with knocking at that gate. Do not go looking for other gates that seem easier, more comfortable, more at hand. Always the same one: Jesus. Jesus never disappoints, Jesus does not deceive, Jesus is not a thief, not a robber. He gave his life for me: each of us must say this: 'And you who gave your life for me, please, open, that I may enter.' "
I had not seen this painting till now. Upon my first look I thought, this would not be my favorite picture of Jesus but would not be my least favorite. After reading your thoughts and Pope Francis' words. I looked at the painting again and had my first thought still but at the same time enjoyed it more, felt more appreciation and fondness for the painting. The image of Jesus The Good Shepherd has always been my most loved. I like the way Pope Francis calls Our Lord,Jesus. This is beautifully written. Thank You.